A very busy section of the auction tent, the phone bids area. LAKEVILLE, CONN. – The roar of race cars is not heard at Lime Rock Park on Sundays, but on many of those days there are other events that attract car lovers, young and old, to Lakeville to see, and sometimes buy, any number of vintage vehicles. September 3 was one of those days when 59 cars, one truck and one race bike crossed the auction block, under the hammer of Dragone Auctions. Achieving one of the top numbers, $577,500, of the day was lot 143, a 1931 Cadillac V-16 Lancefield Convertible Victoria with coachwork by Lancefield of England. This car was owned by the same family for more than 60 years before coming to the United States in the 1990s. It was then that the car underwent a full restoration and was finished in a two-tone black and green. According to the catalog, “This car represents an opportunity to own a unique piece of automotive history”. The phones were exceptionally busy with about 60 people ready to bid, 150 bidding numbers were issued, and more than 85 percent of the lots found buyers. As the last lot was auctioned, a 1915 Harley-Davidson Model K Race Bike, a tally of sales came to more than $3.7 million, including the buyer’s premium. The auction got underway on the dot of 11 am with some introductions and rules of the day, and then bidding for lot 101, a 1986 Saab 006 Convertible Junior, kicked off the sale. Only 75 of this Saab dealer promotional car were produced and were originally sold for $1,900. However, this little car, capable of holding either one child or one adult, and could reach a high speed of 22 miles per hour, proved to not be a popular item. This red convertible, with no reserve, sold within the $1,200-1,800 estimate at $1,375. The little Saab was followed by a King Midget MKIII, 1957, that also had no reserve and was estimated at $5,000-6,000. This car was powered by a rear-mounted air-cooled Wisconsin single-cylinder engine and was cream color painted with a tan top. The doors were of wood, a feature that lasted for only two years, and it sold for $5,170. Bentley Motors was founded in 1919 by W.O. Bentley in Crewe, England, and in a short time became known for manufacturing some of the fastest vehicles in the world. Representing Bentley in the auction was a 1937 4¼-litre Saloon with coachwork by Thrupp & Maberly and factory dual-side mounted spares with metal covers. It is in traditional white with a soft blue leather interior, complete with sun roof and dashboard in real wood. It is powered by a 4,258-cubic-inch overhead valve, six-cylinder engine with twin SU carburetors that is rated at 125 horsepower. This Bentley has had one owner for the past 40 years and it sold to a phone bidder for $58,300, just shy of the low estimate. Three phone bidders were in hot competition for a 1958 Chrysler 300-D, one of 191 convertibles made, this one in raven black paint and two-tone interior. It was restored for more than $200,000 by Little City Restorations of Vancouver, British Columbia, and it has been driven a mere ten miles since its extensive restoration. It is powered by the factory original dual carbureted 392 cubic-inch Hemi with a Cross RAM manifold. This beautiful car was sold with no reserve and went for $149,600, just under the high estimate. 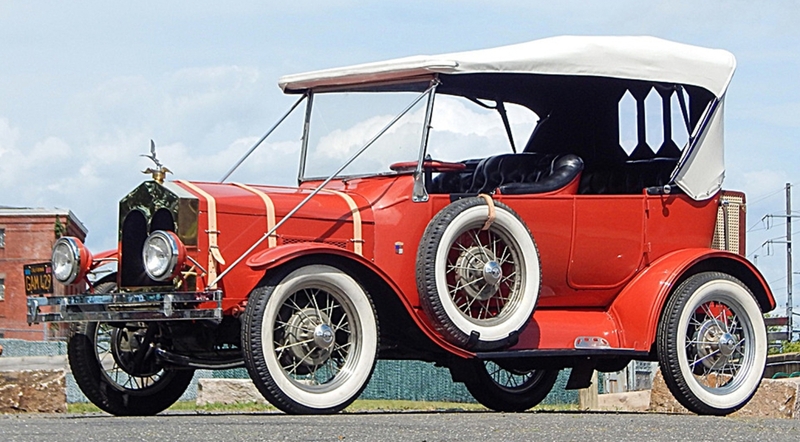 The product of a 100-point restoration by Gregg Tocket was a 1903 Cadillac Model A rear-entrance tonneau, finished in maroon with black accents and a red frame. It has two side wicker baskets, a bulb horn and a 6.5 horsepower engine that is enough to carry four passengers. 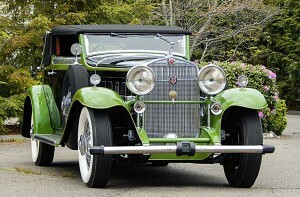 This car was among the vehicles that Cadillac produced in its first year of manufacturing and it sold for $80,940 to a bidder in the first row. The estimate was $90,000-100,000. The Packard Motor Company, founded by James Ward Packard, who built his first car in 1899, dominated the luxury car market for many years, but hit the skids in 1955 after a dismal merger with Studebaker. However, in a last-minute effort, Packard turned out a few luxury vehicles, including the 1955 Caribbean convertible that sold for $5,932. The one in the auction, estimated at $70,000-75,000, sold to a phone bidder for $69,300. It had an excellent restoration, tri-tone paint, and was powered by a 352-cubic-inch overhead valve V-8 engine with dual Rochester four-barrel carburetors rated at 275 horsepower. In addition, this convertible has Ultramatic automatic transmission and lots of power features, including brakes, steering, windows and front seat. Lot 128, a 1935 Packard Series 1201 Coupe Roadster, was road ready with an excellent restoration, sporting a two-tone French gray and white exterior with dual side mounts. The tall grille is topped off with the “Goddess of Speed” hood ornament and the rear luggage rack allows for additional baggage. The car sold for $122,475, close to the low estimate of $130,000. A look at the tents, and the cars out of the rain. No expense was spared back in 1986 when a Connecticut client commissioned ERA to build a 427 “SC” Cobra Roadster, now being offered at auction with only 24,000 miles by just two owners. The many features of this car include black Connolly leather interior, oil cooler with braided steel lines, proper Stewart Warner gauges, real Halibrand pin-drive wheels, sway bars, taillights, fresh air ducts and steel brake lines. It hit right on the low estimate, selling for $50,600. A 1909 Ford Model T Town Car was offered at no reserve and the estimate was $15,000-25,000. It surpassed the high, selling for $37,400. This car was designed to allow the passengers to sit in an enclosed area, while the driver was out in the open and exposed to the weather. This Model T was finished in blue and black, with finished woodwork and a large steering wheel. Only 24,155 miles were on a 1993 Porsche 928 GTS with five-speed transmission and 345 horsepower. It is finished in Midnight Blue with a gray leather interior, and fell just short of the low estimate, selling for $99,000. It was followed by a 1950 Cadillac Series 62 convertible, concours restoration, French gray surface, wide whitewall tires with full wheel covers and a black canvas top. It went within estimate for $66,000. 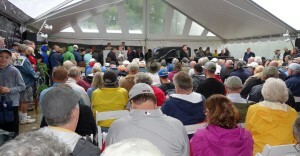 The auction drew a standing-room-only crowd. 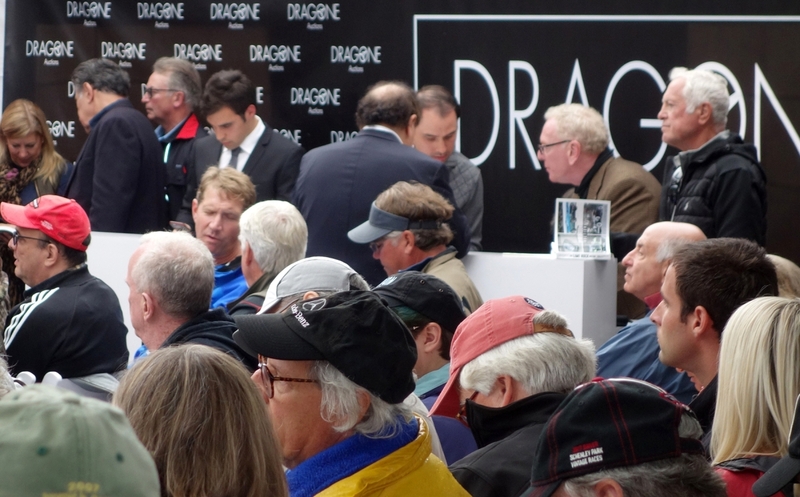 In addition to returning to Lime Rock over Labor Day weekend, Dragone Auctions is considering another car auction in the spring. Announcements will be made when a date is established. Also, Dragone will have a tent at the AACA fall meet in Hershey, Penn., this coming October. Cars for sale will be on display. To contact Dragone Auctions, HQ & Restoration Facility, 1797 Main Street, Bridgeport, Conn. 203-335-4643 or Showroom, 176 Post Road West, Westport, Conn. 203-349-8840. Early in the sale a 1953 Oldsmobile 88 convertible with no reserve was sold within the $50,000–60,000 estimate, bringing $52,250 from a bidder in the front row. Production ended in 1907 after just over 19,000 of this model had been built. This Super 88 borrowed the powerful Rocket V-8 from the Oldsmobile 98 series and retains an older restoration that still looks great. It is painted Agate Red, has a black canvas top, seats six, wire hub caps, and a futuristic rocket-styled spacecraft hood ornament that defines flight in motion.